The main thing to remember when cutting bread is that in order to avoid squashing it you should really be cutting it while it’s completely cool. I know warm bread is lovely but you’ll find it almost impossible to cut without it losing its shape! If you have a really soft loaf then it’s best to start off your bread knife really gently until it starts to get through the crust. Try not to put any pressure on the loaf and just let the sharpness of the blade do the cutting. Obviously it’s a good idea to have nice sharp bread knives! Once you are through the top of the crust continue in sharp strokes while still not putting too much pressure on. It’s hard to stop yourself sometimes pressing down, but a habit worth getting in to. Having nice even slices are not only nicer to look at but they are a great way of getting the most out of of your loaf of bread. If, like me, you have members of your family who just cut without thinking of who else might like some then pre cutting your bread so it’s ready to eat is a great idea too. But how to get those even slices? Another option for slicing bread easily is to go for an electric knife. I’ve not used one of these myself for bread but they are highly rated. 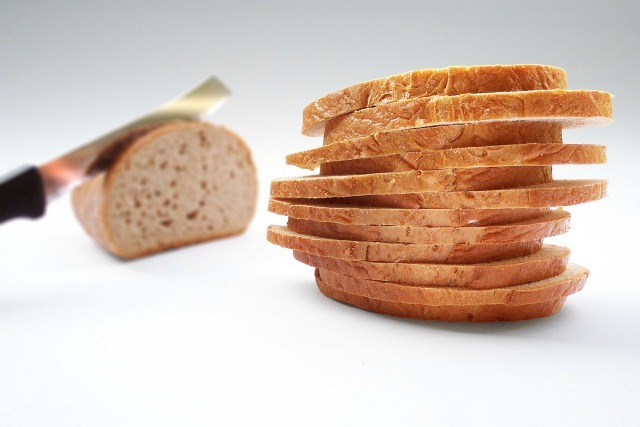 Finally, if you want to stick to an old fashioned bread knife then getting a bread slicer guide is another excellent way of slicing your bread. Simply place your loaf in the guide and use the pre spaced slots to put your knife. They can be had cheaply if you just want a nice basic plastic one or you can get some gorgeous wooden guides too that are a little bit more expensive but look nicer around the kitchen!